These elements are mostly manufactured to customers specifications.They are generally round however certain applications use a flat elements. 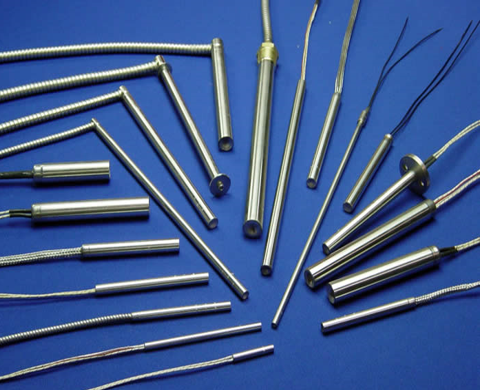 We can supply in a variety of forms from a straight cartridge heater to an angled cartridge heater.We can also design our cartridge heaters to any supply voltage. The material used is s/steel for the outside sheath with magnesium oxide as the insulation material, the resistance wire is a high grade 80% nickle and 20% chrome material. Once the cartridge heater has been assembled it is then put through a swagging machine to compact the MGO insulating material and there after it is put through a centreless grinding machine which grinds the outside dia to a tolerance 0,05mm. High temperature leads are used which has a pure nickle core with a fiberglass over braid.